What has been rumoured for some time was made official on Monday. Zenit St. Petersburg have signed Ukrainian defender Yaroslav Rakitskiy in a deal worth €10 million. The 29-year-old Ukrainian defender has signed a contract that will keep him in St. Petersburg for the next four and a half years. For Zenit and Shakhtar Donetsk this is a deal that satisfies both clubs. Zenit have been in the hunt for a ball playing defender for some time, and Rakitskiy is one of the best in the post-Soviet space, if not in Europe. In fact, technically and in his passing game Yaroslav Rakitskiy might be one of the most underrated defenders in the European game, and it is a surprise that he has not been picked up by a bigger club in Western Europe. But there is an explanation for Rakitskiy’s failed move to the west. 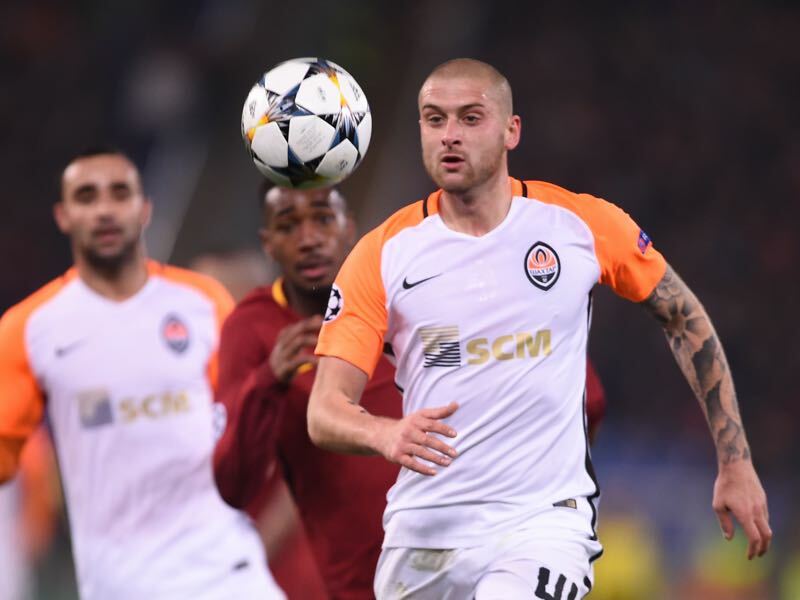 Although a regular starter in big European games the relationship between the 29-year-old and Shakhtar head coach Paulo Fonseca has been strained according to reports from Ukraine. Then there is the political situation. Yaroslav Rakitskiy, in general, has refused to comment on the war in the Donbass. Nonetheless, his refusal to sing the Ukrainian national anthem and to comment about the situation in Eastern Ukraine has led many Ukrainians to believe that he secretly sympathised with the Russian-sponsored separatists fighting alongside Russian troops in Eastern Ukraine. In fact, his decision to now join Zenit drew sharp criticism by some commentators of the Ukrainian game. By signing for Zenit, a club owned and sponsored by Gazprom, Yaroslav Rakitskiy has shown his true colours. It is hard to argue against those commentators. Gazprom, after all, is owned by the Russian state, the same state that has driven the line of politically destabilising their neighbour to the West to protect its sphere of influence. Gazprom, in fact, has played an important role in that stabilisation. The company on several occasions has shut down the pipelines going through Ukraine. Gazprom has justified those shutdowns by stating that Ukraine did not pay their bills and was tapping the lines for their own gains. Justified or not, however, the shutdowns have stigmatised Gazprom as the symbol of Russian imperial hegemony over the post-Soviet space — not just in Ukraine. As a result, Yaroslav Rakitskiy could not have picked a worse club to continue his career in the eyes of many Ukrainian football fans. By showing his “true colours” one article suggested Yaroslav Rakitskiy will finally have the freedom to rebuild his career. He can now play in Russia having turned his back to Ukraine and play his football in peace — especially as Russian clubs cannot be drawn against teams from Ukraine in European competitions. The question, however, is whether Ukraine should still call up Yaroslav Rakitskiy to represent the national team. On a poll conducted on Tribuna 57% of the readers (as of Monday) said that the defender had closed the door to represent Ukraine — 43% believed that football should stay separate from politics. Reading the comments below the post shows that most vocal supporters were surprised by this outcome. Many readers were shocked that 43% believed that football and politics could be separate. One reader, in the meantime, suggested that Rakitskiy should be called up for the first game that will take place in Lviv where the defender could have his legs broken by Banderaists and send straight back to Zenit. One user on Tribuna, however, rightfully pointed out that today three million Ukrainians work and live in Russia. “Russia is conducting a war against us, but still three million Ukrainians live in Russia. That is, almost every twelfth Ukrainian today – in Russia. And among them, there are many who do not like either Putin or Russia but said that he had no other choice. They say we have a lifetime to earn money, and they need to understand, ” the user pointed out. “I think it is a very possible scenario in which he would become a pariah in the team, although I would not like it. Sport should be out of politics, but nowadays everything is possible,” former Ukraine national team player Aleksandr Gorshkov said to Sport24. It shows the gulf of difference between the Russian perception of the situation in Ukraine and the Ukrainian situation. Spending time in Russia the war in the Donbass has very much become a shadow conflict not too dissimilar to Soviet Union’s war in Afghanistan in the 1970s and 80s. Hence, in Russia, most of the focus was on what Rakitskiy could bring to Zenit as a player. “I am very happy right now. I went from one of the top teams to another top team. I will do everything that depends on me and laid out on the field at one hundred per cent for the team. The team always won,” Rakitskiy said to the Russian media. “We needed a good defender to play from the back. We had some issues when playing out from the back, especially on the left side … I have no doubt Yaroslav will make our team better,” Zenit head coach Sergey Semak said. “I think Yaroslav will take little time to adapt. First, the language always helps in such things, and secondly, there is not a big difference between Russian and Ukrainian football,” Semak said when asked about the transition from Ukraine to Russia. Of course, it will be easier to adapt in comparison with players who come from other countries and continents. I think there is no problem,” Semak concluded. Only one Russian commentator pointed out the conflict between the two countries, hoping that the transfer could lead to some reconciliation between the two countries. That would, however, require Russians to recognise the full scale of the conflict in the first place. The problem with this take is that reconciliation seems impossible when the conflict is mostly ignored in the public eye of the country that is the cause for the war in the first place. Furthermore, it also ignores that Yaroslav Rakitskiy has not been popular in Ukraine for some time. The Futbolgrad Network has been in Russia on several occasions and also spent significant time in the country ahead of the World Cup. The perception that we got was that most Russians are either ambivalent about the conflict ranging from imperial dreams to hopes about a peaceful future of co-existence. To sum up, for the clubs, Rakitskiy’s transfer from Shakhtar to Zenit is simply a business transaction. Shakhtar got the money they asked for, and Zenit received a player they needed. For Yaroslav Rakitskiy this is an opportunity to play for a big club far away from political criticism that he has received in Ukraine. Finally, while Ukrainians are incensed about the deal Russians seems to simply shrug their shoulders, which in some ways sums up the relationship between the two countries.